Is life on earth best understood as a valley of tears or as a foretaste of the kingdom of God? Dr Andrew Meszaros addressed this question in this year’s annual Aquinas lecture at Blackfriars, Cambridge on Monday, 29th January, to an audience of about forty-five. 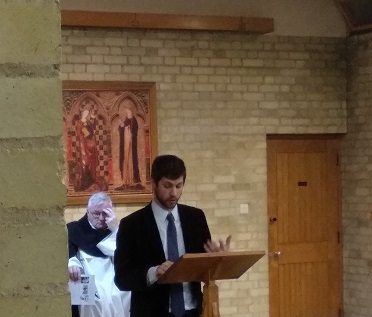 Dr Meszaros, a theologian teaching at St. Patrick’s College, Maynooth, marshalled the audience in eloquent fashion through the intricacies of a 20th century debate on the relation of our earthly existence to that promised us in heaven. On the one side he placed the so-called ‘eschatologists’, who hold that this earthly life is but a pilgrimage, passing, and that we ought to value the world only insofar it facilitates our drawing closer to God and what He promises in the hereafter. Against them were pitted a group of thinkers characterised as ‘incarnationalists’: these would have it that the positive achievements and ‘progress’ of mankind are not only a means of drawing closer to God but positively willed by Him and valuable in themselves. Put another way, is Christianity chiefly a distinctive mode of relating to God or an ethics? Other pressing issues depend on our answer: is pursuing social justice here and now essential for Christians or not? The aim of the talk was not to bring these questions to a definitive answer, but to show how this complex and pertinent debate has drawn upon the resources bequeathed us by medieval authors. Where the ‘eschatologists’ looked chiefly to St. Augustine, the ‘incarnationalists’ cited more from St. Thomas Aquinas: both are seminal thinkers for the Church, and St Thomas, himself a Dominican (in whose honour the annual lecture is held), naturally holds a special importance for the friars. It was a great joy to see a young academic enthusiastically at work with the theological heritage of the Order of Preachers, an enthusiasm that continued into lively discussions over refreshments after the talk.